For nearly twenty years,CrownRing has been one of the leading crafters of some of the most innovative and bold wedding band designs available today. Recognizable for their comfortable construction, CrownRing weddings bands are available in an immense range of types and styles, ranging from sleek and understated, to models that are uniquely diamond-adorned, and everything in between. In addition, various bands by CrownRing feature a beautiful adornment of luminous, handpicked diamonds, and are available in a number of handcrafted settings which includes, bezel, channel, and pave-set, amongst a myriad of other distinctive arrangement. It is for this diversity of styles and models that makes a designer CrownRing piece a truly one-of-a-kind jewelry experience sure to last more than a lifetime. As an authorized CrownRing dealer, Corinne Jewelers is excited to extend to their New Jersey customers, hundreds of distinctive and unique wedding band models from the skilled artisans at CrownRing. Firstly, for grooms looking for a wedding band of an understated, vintage-style timelessness, the rings of the CrownRing Classic collection are sure to please. Plus, browse through the CrownRing Rope collection for polished, matte, and hammered bands all featuring an interlocking lasso-like design in the bands or the CrownRing highly polished, sleek stunners. Finally, for grooms who aren’t afraid of a band that brings a pop of sparkle, the rings of the CrownRing Diamond collection include bands which include striking top-quality diamonds set upon a superiorly built gleaming gold band. the extensive collection of stone adorned stunners. 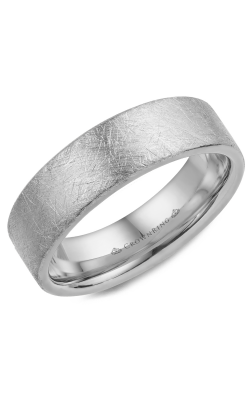 Also, CrownRing wedding bands can be found in literally hundreds of models and variations, made from an assortment of precious metals which include such as, rose gold, white gold, yellow gold, as well as cobalt, just to mention a few, further ensuring that every gentlemen finds his match. Why Shop CrownRing at Corinne Jewelers? In 1964, Mel Blumenthal founded Corinne Jewelers with the singular vision of creating a jewelry shopping experience in where the New Jersey community could find superior customer service, and an expansive inventory that was before then, unparalleled in the Ocean and Monmouth County areas. Located in Toms River, New Jersey, the still family owned Corinne Jewelers offers a number of complimentary services to all their valued New Jersey customers such as, a 30-day return/exchange policy, a lifetime diamond trade back program, as well as complimentary sizing, cleaning, polishing, and appraisal on all items, in addition to a 15% discount on all items for active military, firefighting, and law enforcement personnel.